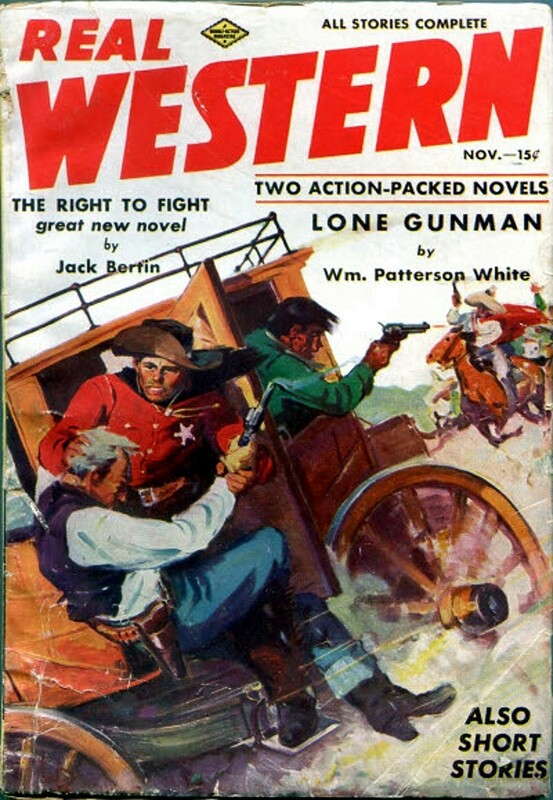 Did any stagecoaches in the Western pulps ever get where they were going without being attacked by bad guys? Judging by the covers, the answer is no. 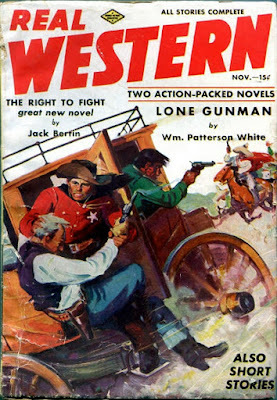 Here's more evidence on the cover of the November 1937 issue of REAL WESTERN. The art looks like the work of H.W. Scott to me, but I could be 'way off about that. Inside are stories by Eugene Cunningham, William Patterson White, Jack Bertin, and someone named Frank Cox, who published only a handful of stories in the late Thirties. Jack Bertin has an interesting background. According to the Fictionmags Index, his real name was Giovanni Bertignono. 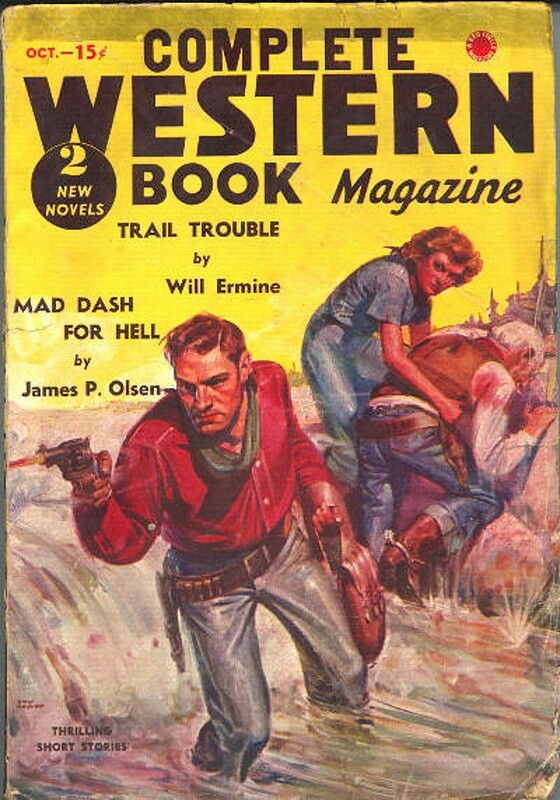 He published several dozen Westerns and a few detective and science fiction stories in the decade between 1928 and 1938. I seem to remember that he was also the uncle of the much more prolific Peter Germano, best remembered under the pseudonym Barry Cord, but I could be wrong about that. There's some connection, though, because Germano is credited with writing two science fiction novels in 1970 that were published under the name Jack Bertin, possibly based on outlines written by Bertignono. I have a copy of at least one of those and ought to read it. I’ve been a fan of Lester Dent’s work for more than 50 years, ever since I picked up the Bantam Books reprint of his Doc Savage novel METEOR MENACE from the paperback spinner rack in Tompkins’ Drugstore and plunked down my 45 cents for it. Since then I’ve read nearly all of the Doc Savages (I’m still saving a few for the proverbial rainy day) and a lot of Dent’s other work. This collection, from the always excellent Black Dog Books, features six non-series novellas by Dent that were published in the pulps DETECTIVE-DRAGNET and TEN DETECTIVE ACES (a retitling of the same magazine) in 1932 and ’33, just before and after he started writing the Doc Savage series. Weird Menace stories were just becoming a sub-genre about that time, so these aren’t quite Weird Menace, but they’re in the same neighborhood. One of the main differences, as Will Murray points out in his introduction, is that the protagonists are two-fisted professional detectives, rather than the civilians who take the lead in Weird Menace stories. But the atmosphere in these yarns often borders on the sinister and creepy. 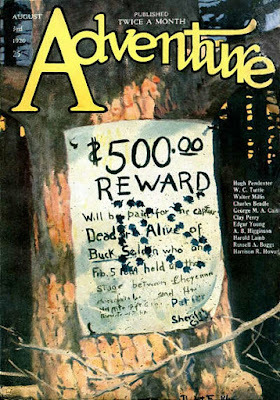 Such as the opening of the title story, “Terror, Inc.”, from the May 1932 issue of DETECTIVE-DRAGNET, in which Kerrigan, a private eye from New York who has been summoned to Los Angeles for a job, opens the door of a car where he’s supposed to meet his mysterious client, and a skeleton topples out, with a lightning bolt mark on the skull that’s the trademark of the killer who calls himself The Spark. Now, if you can read an opening like that and not want to keep going, you’re definitely made of different stuff than me. The second story, “The Devil’s Cargo” (DETECTIVE-DRAGNET, July 1932), doesn’t have any of the macabre stuff, but it’s still a good detective action yarn, with private eye Steve Harden negotiating his way through a maze of violence involving three rival groups who are after some sort of secret. Each of the groups believes that Harden is working for one of the others, and Harden has no idea what’s going on and just wants to find out the truth and stay alive. This one moves like a rocket until the end, which admittedly isn’t quite as compelling as I hoped it would be. 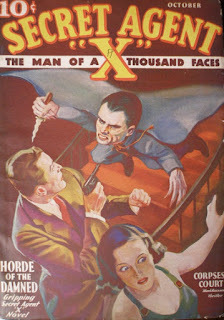 “The Invisible Horde” (DETECTIVE-DRAGNET, September 1932) seems like a dry run of sorts for THE SPOOK LEGION, a Doc Savage novel Dent wrote a few years later. The plots aren’t really similar, but both involve a gang of crooks who discover the secret of invisibility. The protagonist of this one is a scientist who happens to be a former Secret Service agent. Not the most believable of characters, maybe, but there’s plenty of wild action, as you’d expect, so in this case I don’t really care. “The Whistling Death”, from the March 1933 issue of TEN DETECTIVE ACES, like so many of Dent’s Doc Savage novels, revolves around a mysterious, grisly murder method that causes its victims to sweat blood. New York private eye Cleve Dane is summoned to Tampa for a case involving a shady financier who disappeared with five million dollars worth of gold certificates. The case turns into a wild chase through a rainy night after an embalmed corpse that keeps getting stolen. Dent really packs both action and plot into this one; it’s like a condensed novel. And maybe it’s the Florida setting and the fact that Dane seems to be two or three steps ahead of everybody else, but this story really reminded me of a Mike Shayne yarn. Which is a good thing indeed. 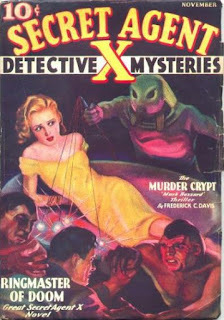 “The Cavern of Heads” (TEN DETECTIVE ACES, April 1933) has a great title and a headlong plot that kicks off with a box containing what appears to be a human head to the detective agency where Dave Lacy works. It’s not actually a head (not really a spoiler, since that’s established almost right away), but rest assured, heads will roll before this yarn is over. Lacy is described more like Monk Mayfair, almost as wide as he is tall, and at one point he takes off his shoes and climbs a wall using fingers and toes like Doc Savage. Dent was writing these stories at the same time as he was getting Doc’s series off the ground, and it’s fun to spot these cross-pollinations. There’s a beautiful platinum blonde, a beautiful redhead, a mysterious anthropologist who collects, yes, human heads, and a seemingly impossible murder method. The thing that’s behind it all has a Doc Savage connection, but I’ll remain mum on that since it might give too much away. This story is atmospheric and creepy as well as action-packed, and it’s just a whole lot of fun. 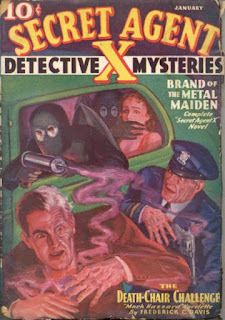 The book wraps up with “Murder Street”, from the May/June 1933 issue of TEN DETECTIVE ACES, and Dent’s love of both gadgets and bizarre murder methods shows up strong in this one. Detective Wes Kaine needs the gadgets to do his job and survive, because he’s undersized (although he can handle himself in a fight). He reminded me a little of Donald Lam as he investigates a case of bodies buried under recently repaired streets. Of course, there’s a connection between the murder victims which leads Kaine into a case where he finds himself in deadly danger more than once. All six of these stories are great fun, with “The Cavern of Heads” being my favorite of the bunch. Nobody did headlong action better than Dent. This would be a decent introduction to his work if you haven’t read it before, although there are probably other things that would be better for that. 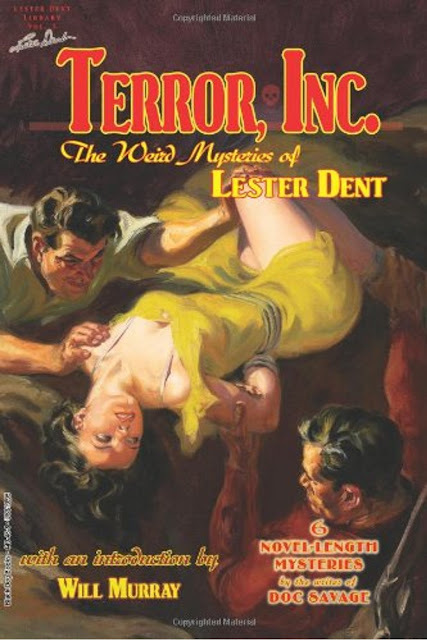 But if you’re already a Dent fan, I guarantee you’ll have a good time with TERROR, INC.
An unusual but effective cover by Dwight Franklin graces this issue of ADVENTURE. 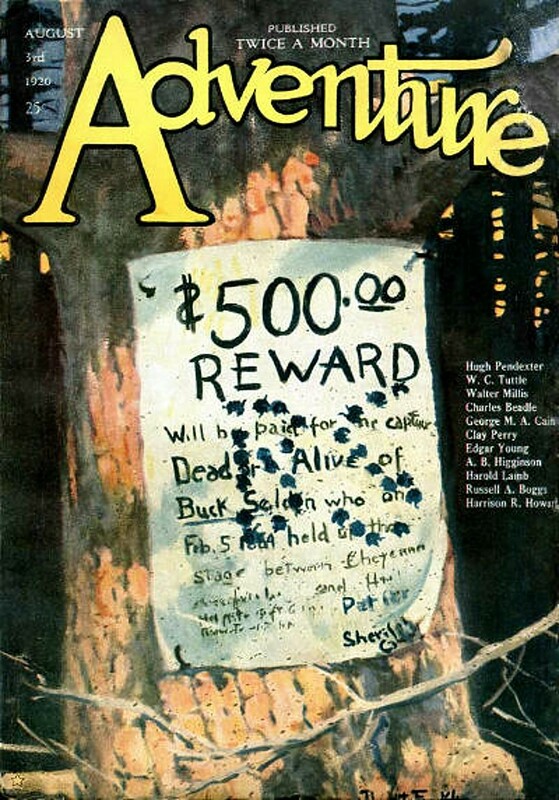 It's a good-looking issue all the way around with stories by W.C. Tuttle (the second Hashknife Hartley yarn, "A Whizzer on Willer Creek"), Harold Lamb (a Khlit the Cossack story), Hugh Pendexter, and Charles Beadle, among other writers lesser known these days. 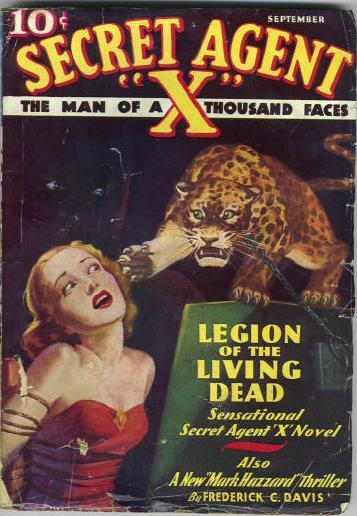 It's easy to see why ADVENTURE was regarded as one of the best pulps. Bears don't always chase beautiful Canadian girls. Sometimes they chase beautiful American ranch girls, too. This isn't a particularly realistic-looking bear, in my opinion, and I'm not that fond of the cover art overall, but there's a great bunch of authors inside this issue of EXCITING WESTERN: W.C. Tuttle with a Tombstone and Speedy yarn; a Navajo Tom Raine, Arizona Ranger story by somebody writing under the house-name Jackson Cole; and stories by L.P. Holmes, Gladwell Richardson, and Barry Scobee (the only pulp writer to have a mountain named after him, as far as I know). Below average cover or not, I'd read this issue. 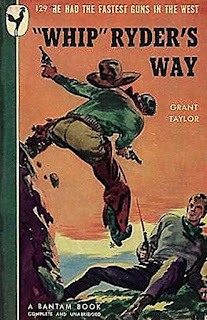 I recently learned that Grant Taylor was a pseudonym used by the prolific author Ray Nafziger, who wrote scores of stories for the Western pulps under his own name and as Robert Dale Denver. It was thought that Nafziger wrote only two novels, both published under the name Robert Denver, but there are a handful of Grant Taylor novels, and one of them, “WHIP” RYDER’S WAY, is available as part of an inexpensive e-book collection. So I picked up a copy right away and read it recently. The only other Nafziger novel I’ve read, HELL-ROARIN’ TEXAS TRAIL, was pretty good, and as it turns out, so is this one. Jim “Whip” Ryder is a young, hell-raising, fast gun cowboy in the Arizona border country—or maybe New Mexico, Nafziger is never clear about that, but it’s not Texas and it’s not far from the Mexican border. The time period is a little ambiguous, too, but since there are primitive telephone and electrical power systems, it’s probably the first decade of the 20th Century. People still use horses and wagons for transportation, though; there’s no mention of automobiles. But to get back to the story, Whip’s older brother Dan (who looks almost identical to Whip, even though they’re not twins) is a lawyer in the settlement of Reyes. Then the bank is robbed and Whip is framed for the crime. He has to flee into Mexico, where he teams up with a couple of other young firebrands, Yancy Yates and Jemez McCarthy, and goes to work fighting bandits on behalf of the American mining interests in the area. Along the way, Whip develops a talent for disguise. And all this is back-story, mind you. As the novel opens, after four years as a fugitive in Mexico, Whip has figured out a way to clear his name and returns to Reyes, with Yancy and Jemez accompanying him, of course. In the meantime, Dan Ryder has become the district attorney and is prosecuting one of the trio of villains who have taken over the area on a charge of murder. The defendant supposedly knows the truth about the bank robbery Whip was blamed for and Whip wants to get his hands on him and make him talk. But the rest of the bad guys plan to murder his district attorney brother before that can happen. Whip’s old sweetheart, who owns a worthless ranch, is still around, too, and so is a Mexican revolutionary/bandit modeled after Pancho Villa who has fled across the border into the U.S. after the Federales crushed his rebellion. He’s rumored to have brought several hundred thousand dollars worth of looted gold with him. Got all that? There’s plenty in the pot for Nafziger to stir around, and I’ve probably even forgotten a few things. But man, does this book move! There are disguises and hidden identities galore, shoot-outs, desperate chases, a Mexican carnival, hair’s-breadth escapes, and a whole bunch of last-minute plot twists and revelations that probably won’t take many modern readers by surprise but are still fun. More than anything else, the whole thing reminds me of a late Republic Western serial, with Clayton Moore, maybe, playing both Whip and his brother Dan. And lots of action directed by William Witney, of course. I’ve already rustled up another of Nafziger’s Grant Taylor novels. If they continue to be this enjoyable, I have a hunch I may wind up reading all of them. Last month I posted about the three stories from ROCKET'S RED GLARE that are going to be reprinted in THE YEAR'S BEST MILITARY AND ADVENTURE SF, VOLUME 4, published later this year by Baen Books. You can now read editor David Afsharirad's introduction to this anthology here. 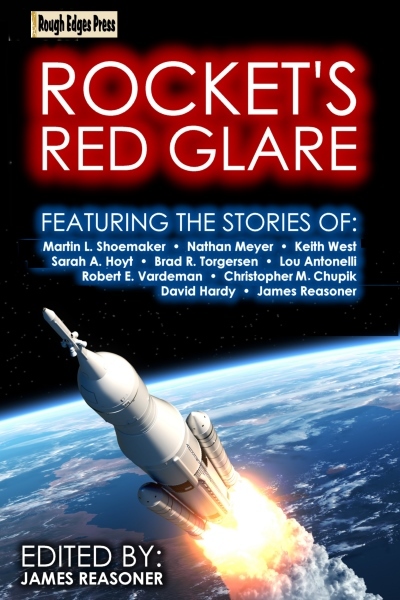 There are more stories from ROCKET'S RED GLARE in this book than from any other source, and I'm very proud of that fact. I'm also proud of all the other great stories in ROCKET'S RED GLARE, and it's still available in ebook and print editions from Rough Edges Press, of course. When I was a kid, I was a fan of Tex Ritter’s movies and watched many of them on TV. 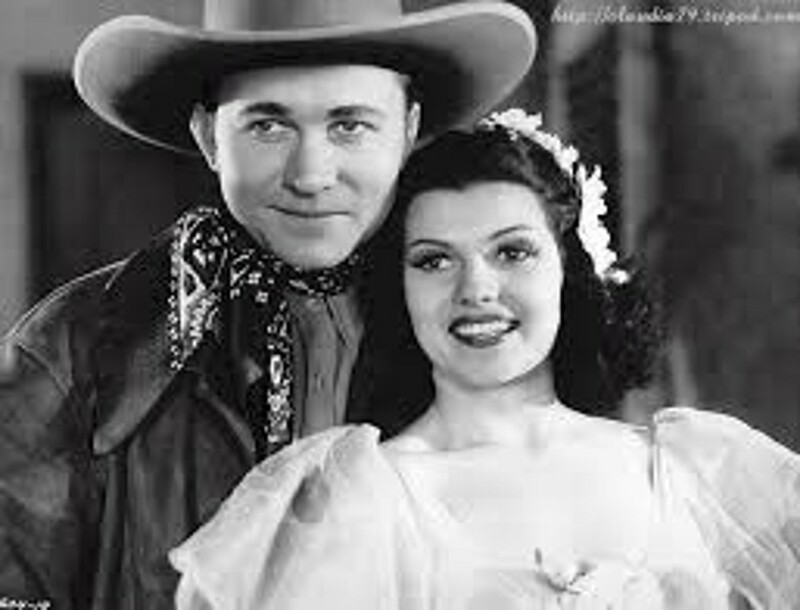 Unlike Roy, Gene, and Hoppy, though, ol’ Tex is one of the B-Western stars whose work I haven’t revisited much as an adult. 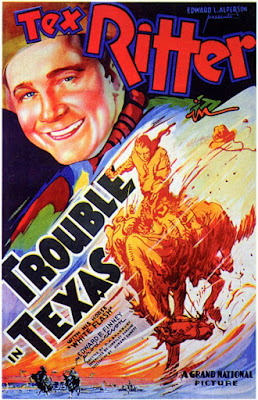 Based on my recent viewing of his 1937 feature TROUBLE IN TEXAS, I think I probably ought to remedy that. This picture finds Tex playing Tex Masters, a drifting cowpoke and rodeo competitor who’s actually on the trail of the gang responsible for his brother’s death several years earlier. This gang travels around taking part in various rodeos, and one of them, Squint Palmer (Yakima Canutt), always takes the top prize money because the gang murders anybody who could beat him. This is what happened to Tex Masters’ brother. Unknown to Tex, who’s accompanied by his boastful sidekick Lucky (Horace Murphy), the law is also after the rodeo gang and has an undercover agent working the case: a beautiful young woman named Carmen (Rita Cansino, who, after this movie, would be billed under another name—Rita Hayworth). Tex falls for her, of course, but he believes that she’s really a member of the gang, which causes some complications. After a lot of rodeo action, Tex gets the proof he needs to expose the gang as his brother’s killers, which leads to an epic chase scene as several members of the gang flee on a wagon. 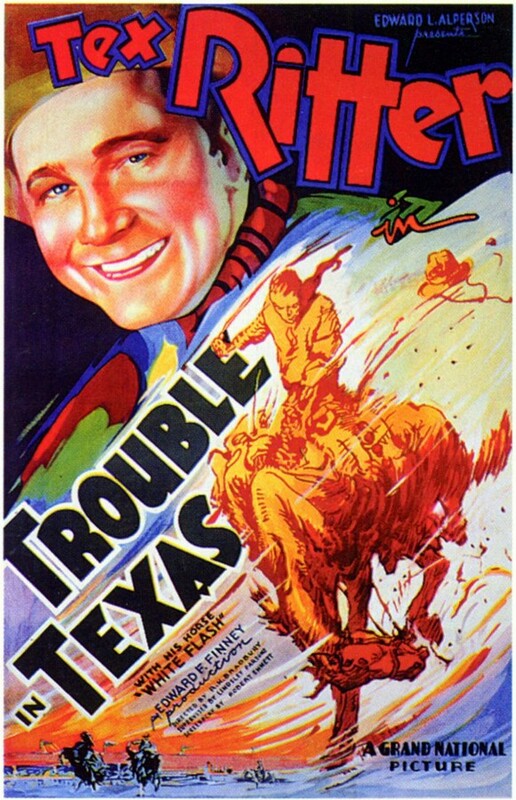 TROUBLE IN TEXAS is an unofficial remake of a 1934 John Wayne movie, THE MAN FROM UTAH, and uses a lot of the same rodeo stock footage as the earlier picture. Too much stock footage, in my opinion, because those scenes go on and on. I would have tightened those up and maybe cut one or two of Tex’s songs, even though I do like his singing. Other than those quibbles, though, this is a pretty darned entertaining B-Western. Yakima Canutt really works overtime in this one, with stunt after stunt including some great stuff in that final chase. The other main villains are played by Earl Dwire and the always fun to watch Charles King. Glenn Strange, who usually played a bad guy, is the local sheriff in this one and looks great, although he doesn’t have much to do. And Rita Hayworth is, well, Rita Hayworth. Yowza, in other words. This movie was directed by Robert N. Bradbury, whose low-budget Westerns were usually better than they had any right to be, always well-paced and with decent scripts. Bradbury (who was Bob Steele’s father) also directed the earlier John Wayne film THE MAN FROM UTAH, so he was certainly familiar with the material. Other than the over-abundance of stock footage, TROUBLE IN TEXAS is a pleasure to watch. I realize I haven’t said much about Tex himself. Round-faced and a little on the beefy side, he’s not the prototypical B-Western cowboy star, but gosh darn it, he’s a likable galoot, with screen presence, a good singing voice, and enough athletic ability to look convincing in the fight scenes and on horseback. I need to look through my collections of B-Westerns and see if I have any more starring him, because I think I might like to watch another one before too much longer. While in Florida on vacation, Lt. Al Wheeler tangles with a redhead with green eyes who is "Nobody's girl but my own!"... Her club-owning gangster boyfriend, who is involved in some very shady business... and his gorilla henchman, who is seven feet of muscle and bone, just waiting for the chance to crush him to a pulp when Al becomes the decoy sent in to bring their racket down. When Lt. Al Wheeler tries to solve a murder at a science fiction convention he discovers a professor who wants to stop time by tricking the elusive Delfs... meets an intellectual gangster who wants to get his hands on the professor's latest invention... is frustrated by the generously proportioned convention organizer, who somehow manages to keep one step ahead of Al's wolfish designs. Which finds Lt. Al Wheeler trying to solve a hit-and-run murder involving the victim's wife, who is all too glad to have lost her lush of a husband... the beautiful skip-tracer who tracked down the victim right before he met his untimely end... and her dubious boyfriend who may not be as innocent as he professes, but is certainly up to no good. 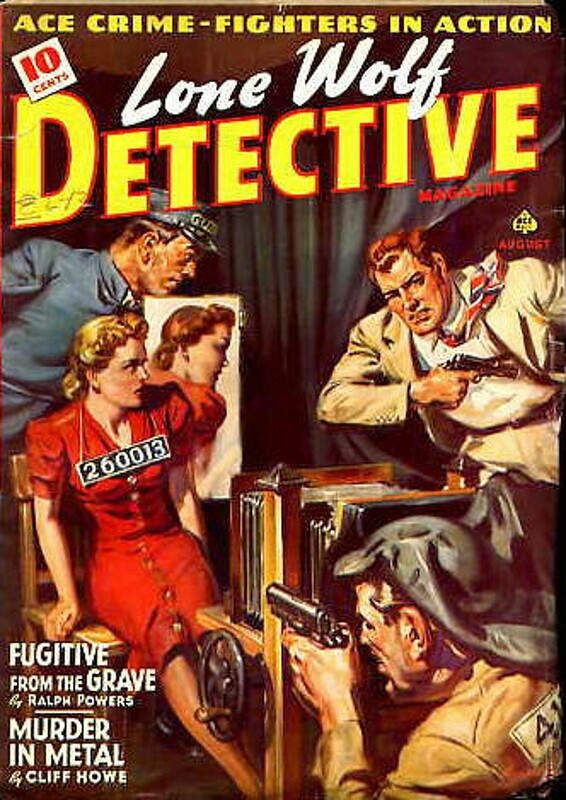 Another great cover by Norman Saunders on this issue of LONE WOLF DETECTIVE MAGAZINE, and his is probably the only real name associated with this issue. I say this because the stories inside are by Ralph Powers, Cliff Howe, Ronald Flagg, Paul Adams, Grant Mason (all house-names, and the stories are probably all retitled reprints), and Francis J. McTeague, whose story in this issue is his only credit in the Fictionmags Index, leading me to think that may be a house-name, too. Anyway, Francis J. McTeague just sounds like a pseudonym to me. Francis, if you or any of your relatives are out there reading this, my apologies for doubting you, and please let me know. 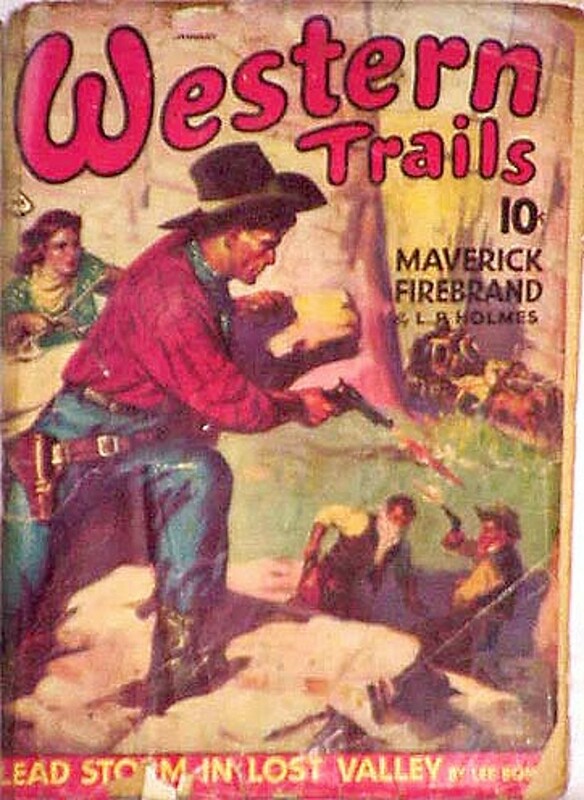 This issue of WESTERN TRAILS features novelettes by two of the most dependable Western pulpsters, L.P. Holmes and Lee Bond, along with stories by Orlando Rigoni, an author whose books I've seen around forever without reading any of them (something I plan to change in the relatively near future), Clint Douglas (a house-name), and several other authors I haven't heard of before. 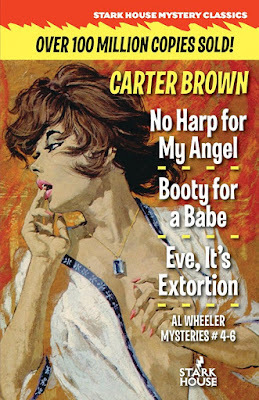 I'd read this issue just for Holmes and Bond, though, and any other good stories would be a bonus. WHITE SAVAGE may be my favorite of the Ki-Gor novels so far. 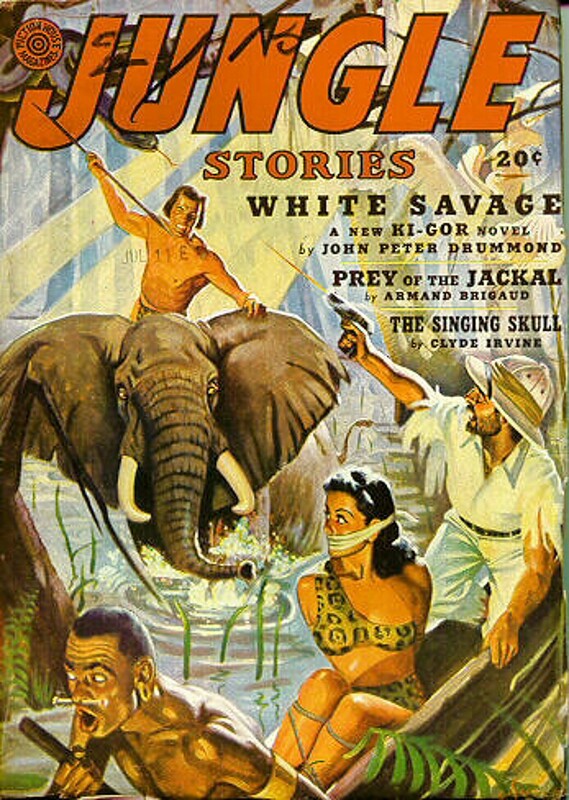 Originally published in the Fall 1941 issue of JUNGLE STORIES, this yarn finds Ki-Gor and his beautiful redheaded American wife Helene affected by the spread of World War II into Africa, as they encounter some sinister Italians before running afoul of an even more dangerous lost race. It’s difficult to explain too much about the plot of this one without venturing too far into spoiler territory, so I’ll just say that this is easily the creepiest Ki-Gor novel yet. It’s pretty well written, too, by an unknown author with a smooth, fast-paced, evocative style. The way it’s structured is a bit of a problem, because it comes across like one novelette crammed into the middle of another novelette to make a full-length novel, but the author handles this deftly enough that it works. Ki-Gor’s sidekick Tembu George, who has become one of my favorite pulp characters, makes a brief but important appearance, as does good old Marmo the elephant. Best of all, Helene, while not quite the badass of the early books, is much tougher and competent in this story and actually has stuff to do, instead of just standing around looking beautiful and getting kidnapped, as she does in some of the other novels. With this novel and the previous one, KI-GOR—AND THE TEMPLE OF THE MOON GOD, I get the feeling that this series is starting to hit its stride. The next volume in the reprint series from Altus Press is on its way to me, and I’m looking forward to it. 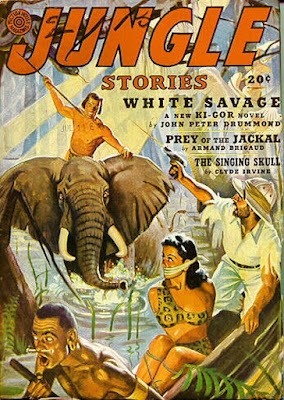 In the meantime, I’d recommend WHITE SAVAGE to anyone looking for an exciting jungle pulp yarn. Although there were a few directed by other hands, Roy Rogers movies generally fall into two distinct groups: those directed by Joseph Kane and those directed by William Witney. Kane came first, as he helmed most of Roy's pictures for the first decade of his career. Generally speaking again, the Kane-directed movies are more musically oriented, with half a dozen songs in each one and even some elaborate production numbers, while the Witney-directed movies have more complex plots and concentrate on hardboiled action. As I've said many times before, I prefer Witney, but there's a lot to like about many of the Kane movies, too. THE YELLOW ROSE OF TEXAS was directed by Kane, and at least it has a plausible plot reason for all the song-and-dance stuff: much of it takes place on a showboat where Roy (playing Roy Rogers) and Dale (playing a character named Betty Weston) work as entertainers. 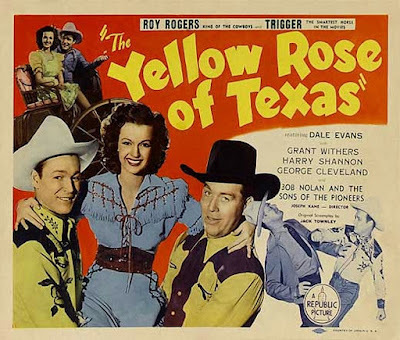 As the movie opens, the boat, which is named the Yellow Rose of Texas, is pulling into Prairie City, which holds some bad memories for Betty. She used to live there, until her father was accused of stealing a payroll and sent to prison. Now she finds out that he has escaped recently, and the law believes he'll try to get in touch with her, so they're keeping an eye on her. I don't think anybody reading this is going to believe that Dale Evans' father would ever steal a payroll, and you're not going to be surprised that Roy winds up trying to catch the real crooks so he can clear the old guy's name. The script by Jack Townley actually has one nice twist to it, but it tips its hand 'way too early, as far as I'm concerned. A revelation about one character should have come much later in the film. Roy doesn't really have a sidekick in this one, either, unless you count character actor William Haade, who plays an old friend of his named Buster. Haade is okay, but he's no Gabby Hayes or Andy Devine or Smiley Burnette. Heck, Gordon Jones as Splinters McGonigle is a better sidekick. But I digress . . . I like riverboat stuff, so I enjoyed THE YELLOW ROSE OF TEXAS even though the boat is docked for most of the movie. The plot is fairly interesting, Bob Nolan and the Sons of the Pioneers are on hand and good as usual, and although the movie could have used more action, what there is of it is handled well. This is a minor entry, probably more for Roy Rogers completists than casual fans, but I enjoyed it. Bob Randisi’s Rat Pack books are some of the most entertaining mystery novels currently being published. The latest one, I ONLY HAVE LIES FOR YOU, is out from Pro Se Productions, and it continues the excellence of this very strong series. The narrator/protagonist of these books is Eddie Gianelli, better known as Eddie G., a former pit boss at the Sands casino in Las Vegas who has evolved into kind of a fixer and troubleshooter for the celebrities and high rollers who frequent the casino. In this novel, Eddie travels to Miami Beach with Frank Sinatra to meet Jackie Gleason. At first this seems like an innocent trip, little more than a vacation, but then June Taylor (of the June Taylor Dancers, featured on Gleason’s TV show) asks Eddie to look into the problem of someone who’s stalking her sister Marilyn, also a dancer on the show and maybe not so coincidentally, Jackie Gleason’s long-time mistress. Eddie has barely gotten started on this favor when a dead body shows up, and there’ll be more murders later on, including that of a police detective, as the action bounces back and forth between Las Vegas, Miami Beach, and other locations in Florida. Eddie gets help from Jerry Epstein, a very likable character despite his connections to the Mob, and Vegas PI Danny Bardini. Randisi confronts them with plot twist after plot twist, but in the end the complicated affair all makes sense . . . but not until Eddie has risked his life to expose a killer. As always with a Randisi book, I ONLY HAVE LIES FOR YOU is fast-paced and driven by fine dialogue. An added element in the Rat Pack series is his excellent depiction of the era, which I also remember quite well. (Bob and I are about the same age.) I recall watching and enjoying Jackie Gleason’s variety show on Saturday night. My dad always enjoyed the bits featuring Gleason as Joe the Bartender and Frank Fontaine as Crazy Guggenheim, and I did, too. In a period mystery, getting the details right is a tricky business, and so is not overdoing such details. Randisi nails both of those things in this series. 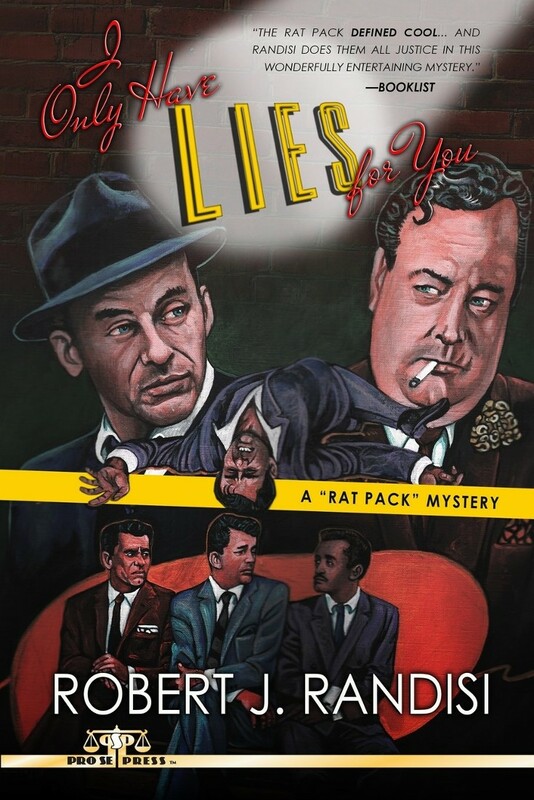 I really enjoyed I ONLY HAVE LIES FOR YOU. If you’ve never read any of the Rat Pack books, it would work fine as an introduction, and if you have, you’ll definitely want to read this one, too. 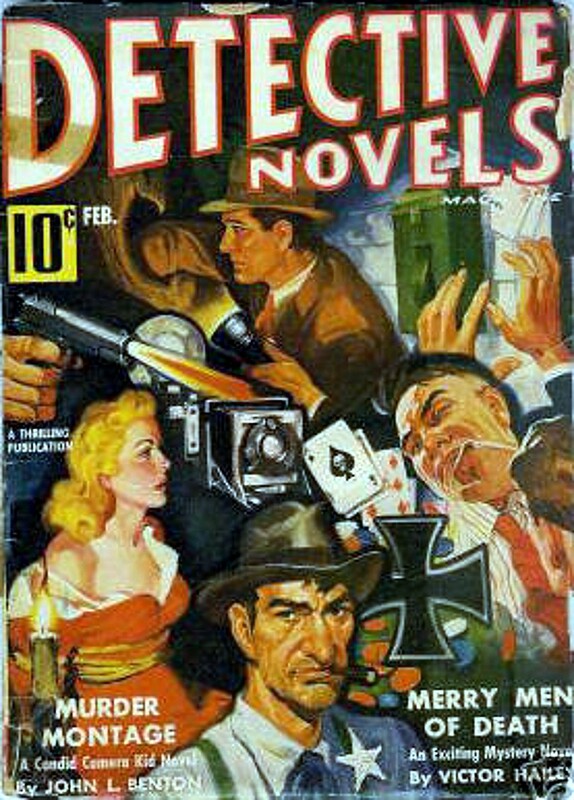 This issue of DETECTIVE NOVELS sports about as busy a pulp cover as you'll see. The lead story is a Candid Camera Kid novel by Norman A. Daniels writing as John L. Benton. I've read several of the Candid Camera Kid stories, featuring diminutive but two-fisted newspaper photographer Jerry Wade, and I found them very enjoyable. If somebody wanted to reprint that series, I wouldn't mind at all and certainly would buy such volumes. Also in this issue is a story by my old mentor, Sam Merwin Jr., and yarns by a couple of writers I'm not familiar with, Victor Hailey and Louis Owens. But for me, this issue would be worth reading just for the Daniels and Merwin stories. Labels: Candid Camera Kid, mystery fiction, Norman A. Daniels, pulps, Sam Merwin Jr.
Two novellas take up most of the pages in this issue of COMPLETE WESTERN BOOK MAGAZINE, and fortunately they're by two top-notch pulpsters, Will Ermine (who was really Harry Sinclair Drago) and James P. Olsen (who was really James P. Olsen but was also very prolific under the name James A. Lawson). There are also short stories by the distinctively named Carmony Gove, who wrote a lot for various Western and detective pulps, and Bob Marsh, not a distinctive name at all and also not very prolific with only three stories in the Fictionmags Index. I've enjoyed everything I've read by Drago and Olsen, though, under their real names or whatever pseudonyms they were using, so I suspect this is a pretty good issue. I like the title of Olsen's story, "Mad Dash for Hell". 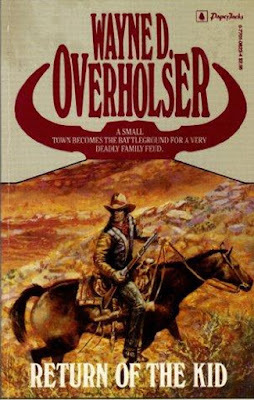 Wayne D. Overholser is one of those writers whose books have been around on library and used bookstore shelves as far back as I can remember. For some reason, though, I’ve never read much by him. A few novellas and short stories originally published in the Western pulps, but no novels that I can recall. 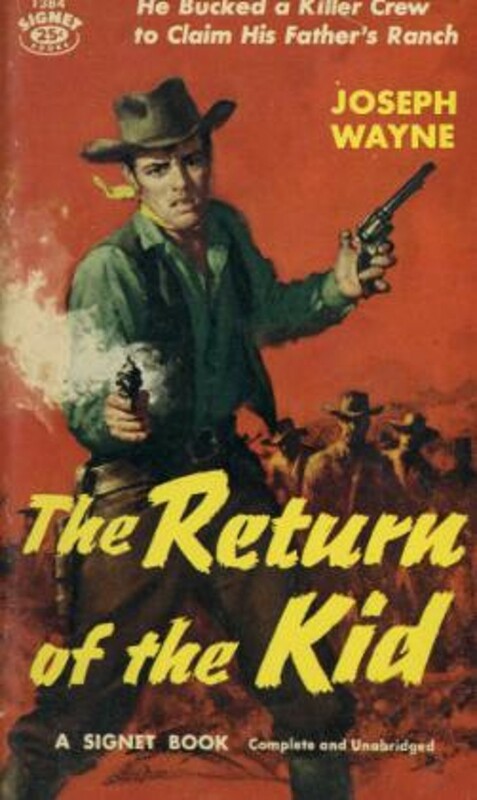 However, I recently came across a large print hardback of his 1955 novel THE RETURN OF THE KID and decided to give it a try. 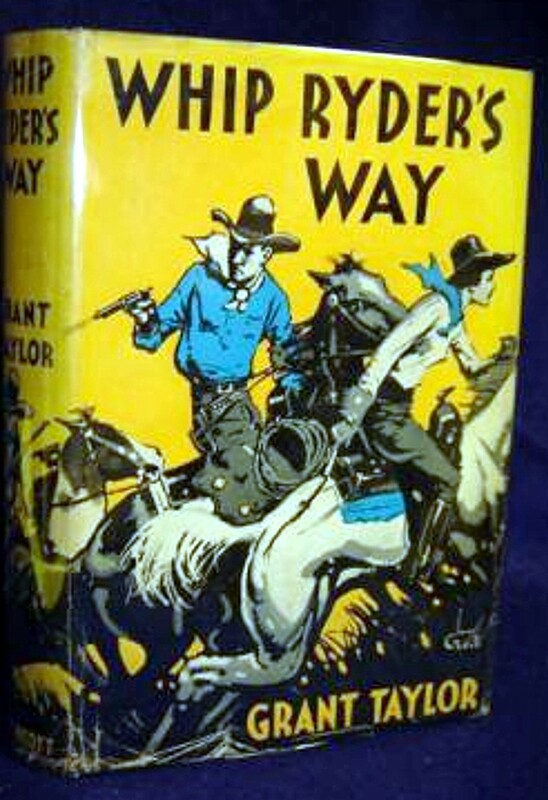 This novel was published in hardback by Dutton under the name Joseph Wayne, a pseudonym shared by Overholser and Lewis B. Patten. Evidently, some of the Joseph Wayne books are by Overholser, some by Patten, and some are collaborations between the two men. But since the copyright on this book was renewed by Overholser and it’s been reprinted more than once under his name, I assume it’s one he wrote without Patten. As you might guess from the title, THE RETURN OF THE KID is a prodigal son yarn. 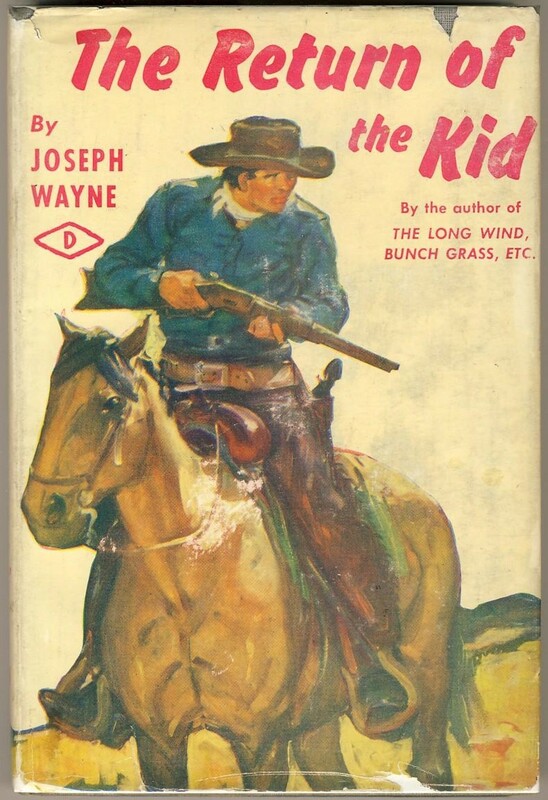 (One minor problem is that nowhere in the book does anybody refer to the protagonist as “the Kid”. But I digress . . .) Jim Dunn returns to his hometown in Colorado after three years as a drifter. He’s the son of the biggest rancher in the area, who has died under mysterious circumstances several months earlier, after marrying a beautiful, much younger woman. It was this marriage, in fact, that caused the trouble between Jim and his father and led to his leaving home. Now his father is dead and the widow and the sinister foreman she’s hired are poised to take over and cut Jim out of his inheritance. He doesn’t intend to let that happen. But then not everything turns out to be exactly the way Jim believes it to be, and more than one person surprises him. One thing that’s not a surprise, though, is that somebody keeps trying to kill him, and lots of bullets will fly before he sorts everything out. As you can tell from that set-up, there’s not much in this book that you haven’t seen many times before. In that way, THE RETURN OF THE KID reminds me of the work of L.P. Holmes, who also used standard plots in his novels but wrote them extremely well. Overholser wasn’t the writer that Holmes was, though, at least not in this book, so I had a little trouble with the predictability of the plot and the deliberate pace early in the book. The story never does work its way up to much of a gallop. However, Overholser has a deft touch with his characters, and the action scenes are good and tough. There are just enough plot twists to keep things interesting. 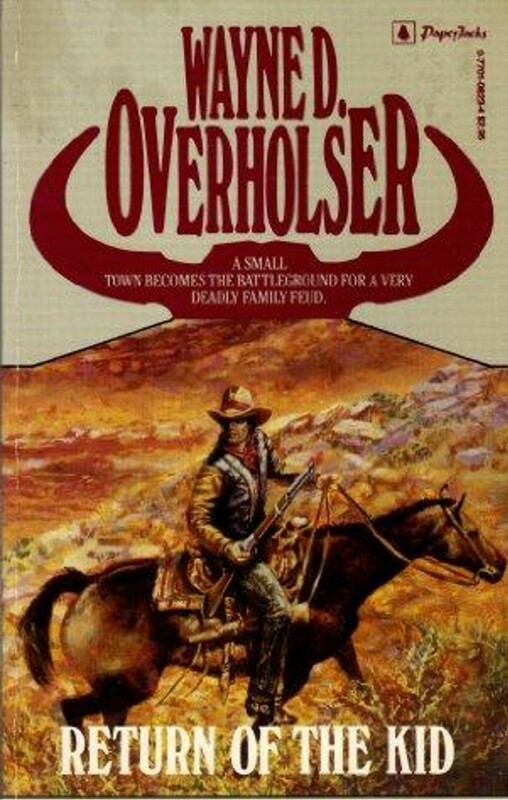 I can see why Overholser had a long, successful career as an author of traditional Westerns, even though I didn’t think THE RETURN OF THE KID was anything special. I enjoyed it enough that I’ll read more by Overholser, but it’ll probably be a while before I get around to it. 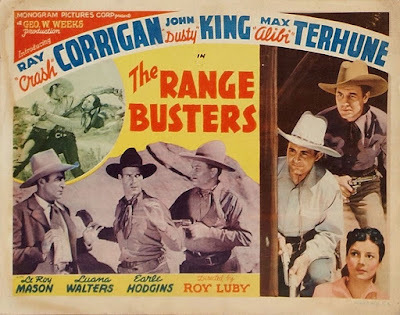 The Range Busters were Monogram's lower-budget answer to Republic's The Three Mesquiteers, with two former Mesquiteers in Ray Corrigan and Max Terhune (John King was the third Range Buster). But THE RANGE BUSTERS is also the title of the first movie in the series. The three old friends, Crash (Corrigan), Alibi (Terhune), and Dusty (King) get together to help out a rancher friend of Crash's, but it turns out the man is murdered before they ever get there by a mysterious killer known as the Phantom. But the rancher has a beautiful daughter (Luana Walters) who inherits the ranch, so of course they hang around to give her a hand and catch the Phantom. I've seen several of the Range Buster movies, and the scripts are usually the weakest element, often making little if any sense. This one's actually not bad, though. It hangs together fairly well, and I was even mildly surprised a couple of times by plot twists. However, there are some really dubious scenes along the way, such as the one where Crash sends Alibi into an ambush so he can circle around and get the drop on the bad guys from behind. It's a good thing those bushwhackers are such bad shots, or the Range Busters would be down a man. Overall, though, Corrigan and Terhune are likable as always, King is less annoying than usual, Luana Walters is beautiful, the stunt work is okay, and there are dependable supporting cast players such as Frank La Rue and Kermit Maynard. THE RANGE BUSTERS is an entertaining way to spend an hour if you're a B-Western fan and probably the best one in the series I've seen so far. It's nowhere near as good as the best of the Mesquiteers movies, though, such as RIDERS OF THE WHISTLING SKULL. 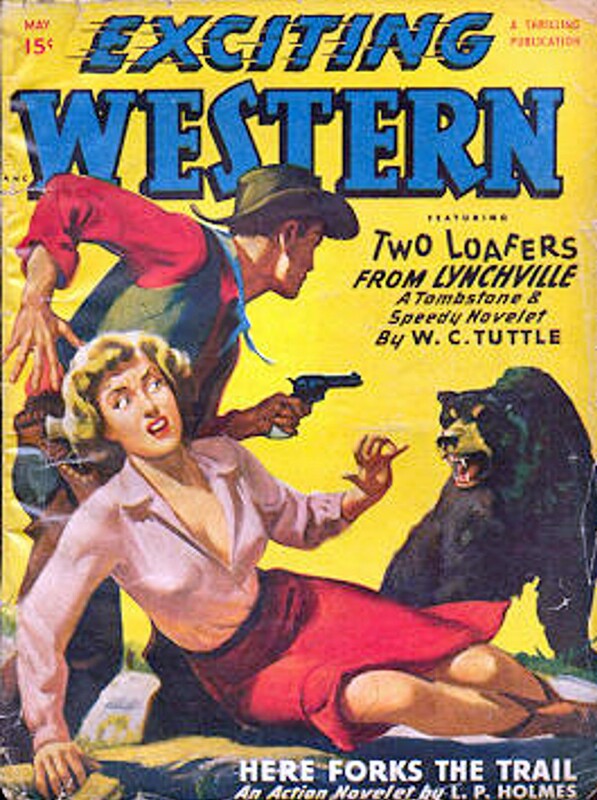 As far as I've been able to tell without doing a lot of research, the cover painting for this issue of G-MEN isn't a redone Western pulp cover and wasn't turned into a Western cover after being used here. But it sure looks like it could have been. Change the guns, put the guy in a yellow or blue cowboy shirt, and give him a bandanna instead of a tie, and you've got a TEXAS RANGERS or THRILLING WESTERN cover. 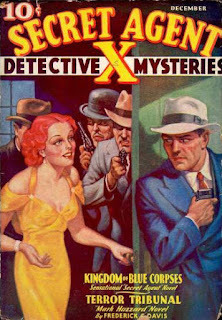 Artist Richard Lyon provided numerous covers for both of those pulps. Inside is a Dan Fowler story, of course, and I've always enjoyed those yarns about the stalwart FBI agent. The author behind the C.K.M. Scanlon house-name on this one may have been Whitney Ellsworth, best remembered these days as an editor for DC Comics. The back-up short story is by William T. Cowin, an author I'm not familiar with. 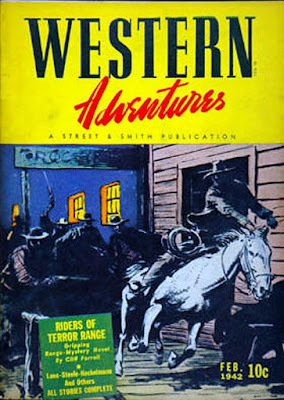 WESTERN ADVENTURES may have been Street & Smith's third-string Western pulp, behind WESTERN STORY and WILD WEST WEEKLY, but I've always thought it had some pretty strong issues. I like the cover on this one, and there's a fine line-up of authors inside including Cliff Farrell, Norman A. Fox, Gunnison Steele, Jim Kjelgaard, S. Omar Barker, and Charles N. Heckelmann. The more I read by Frederick C. Davis, the more he becomes one of my favorite pulp authors. He was the original author on the Operator 5 series (the forerunner of James Bond, the Man From U.N.C.L.E., and all the other secret agent adventurers of the Fifties and Sixties), and I first encountered his work in the Corinth paperback reprints of novels from that series close to 50 years ago. Of course, at the time I had no idea who “Curtis Steele” (the pseudonym that later became a house-name) really was, but I sure liked those stories. In recent years I’ve read more by Davis, who went on to write a ton of pulp stories in various genres, then became a respected mystery novelist whose books appeared in hardback and paperback. His stories are always well-plotted and have plenty of action, and he writes in a clean, fast-paced style. In 1935, Davis wrote six novellas featuring redheaded, two-fisted district attorney Mark Hazzard that ran as a back-up series in the pages of the pulp SECRET AGENT X. Hazzard has a tragic secret in his past that makes him more concerned with justice than with the niceties of the law. 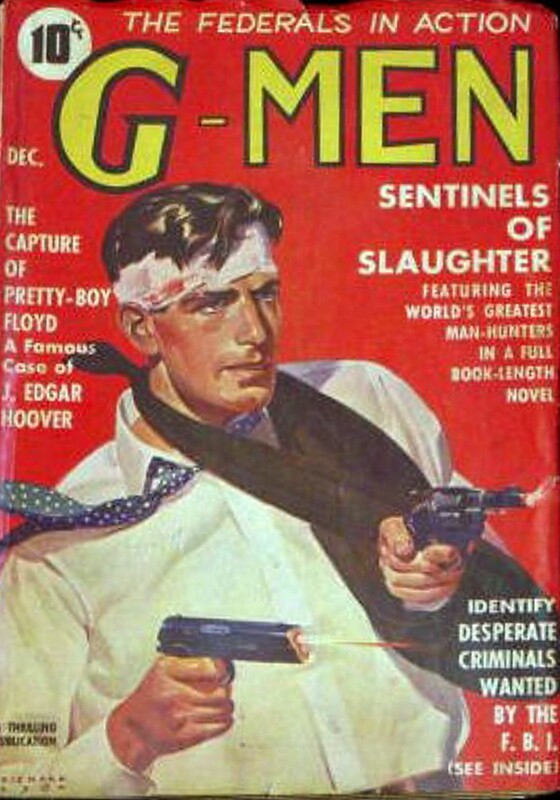 Most pulp characters with a similar background would don a disguise to fight lawlessness and be district attorney by day, masked avenger by night. But not Mark Hazzard. He does all his crime-busting, whether technically legal or not, as himself, with the help of his beautiful secretary (they love each other, of course, but can’t act on that love because of the dangers in which Hazzard is always putting himself) and an escaped convict who was framed for murder and is really a good guy. I’m not going to summarize them, but each involves some sort of miscarriage of justice that Hazzard has to resolve as a tough-guy vigilante rather than an attorney, all while fending off the dangerous investigations of Inspector Trencher, a police detective who’s convinced that Hazzard is hiding some secret and is really a crook. 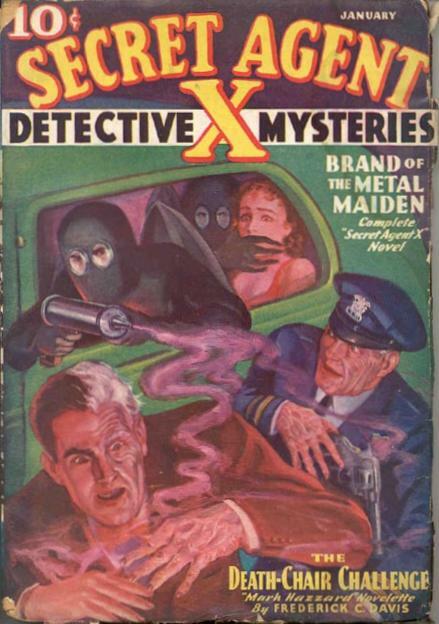 There’s not much in these stories that you haven’t seen in dozens of other pulp yarns (the police detective nemesis, for example, was a staple of the Secret Agent X series, the very magazine in which the Mark Hazzard stories appeared). One of the stories near the end has a surprising and intriguing twist that I wish Davis had made more of, but by the next story it seems to have been forgotten. 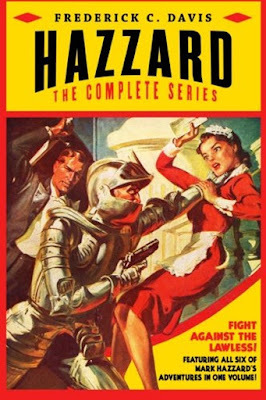 Also, like most pulp series, the saga of Mark Hazzard just comes to an end and has no real conclusion. But Davis tells the stories so well, with such skill in plotting, pacing, and action, that I had a great time reading them anyway. The entire series has been reprinted in one volume from Altus Press, and if you’re a pulp fan, I give it a high recommendation.